Follow this link for news highlights about the STEREO mission. Below, we list additional entries concerning the STEREO instruments and data. Please note that our alternative anonymous ftp access will be deactivated on or before 31 July 2019 to comply with NASA directives. All data previously available via ftp can be downloaded via https from the same locations under the pub subdirectory on this server. A new page on opportunities for collaborative science with Parker Solar Probe has been added, describing the orientation of STEREO to Probe for the various Venus encounters and perihelion passes. Four years after the initial loss of communications anomaly with Behind observatory, NASA has directed to cease periodic recovery operations with the last support on October 17, 2018. Additional information can be found here. Both IMPACT and PLASTIC are back to full science operations after the power spike anomaly on September 23. On September 23, the STEREO Ahead spacecraft detected a power spike on the electronics shared by the IMPACT and PLASTIC instruments, and autonomously powered them down. This is believed to be due to a single event upset. A similar event occured in September 2011. Recovery operations are proceeding. Most of the IMPACT functionality has been restored, and PLASTIC is expected to resume operations over the next few days. New labeling has been applied to HI1 and HI2 images to make them easier to read against a bright background. This also applies to the Planet Finder pages. In addition, the planet labels have been repositioned so that they do not overlap with each other. COR1 polarized brightness (pB) images and movies have been added to the STEREO daily browse pages. With the aging of the COR1 telescope in the 10+ years since launch, and the advent of gyroless operations in September 2013, it has become more difficult to separate the coronal signal from the COR1 instrumental background immediately after the data are taken. This separation can be more easily performed in polarized light, which can be derived from most of the COR1 data, so optional pB images and movies have been added. At the present time, only the most recent data have been reprocessed to provide pB images. A new browse tool has been added to show what planets are visible on any given date. On Wednesday, November 16, one of the COR1 temperature sensors briefly exceeded a software limit during a scheduled momentum dump of the STEREO Ahead spacecraft. This triggered an autonomy rule which disabled the COR1 telescope. From that point on, until COR1 operations were restored at 20 UT the next day, the missing scheduled COR1 images disrupted the timing of the image processing for the other telescopes such that images from one telescope were being misdirected to the processing for another telescope. This resulted in many apparent "double exposures", such as this example where an EUVI image has been superimposed on a normal HI-1 image. All the telescopes were affected, except COR1 which was disabled. The temperature limit on COR1 is being adjusted to keep this from happening again. There have been six attempts to contact the Behind spacecraft using 70 meter stations between September 27 and October 9 without success. The last telemetry received from Behind was on September 18, and the last time the carrier wave was detected was on September 23. Recovery attempts for Behind have moved back to a monthly schedule until the spacecraft has returned to a point in its orbit where the attitude is in a favorable configuration for power and communications. The following summarizes the activies that have taken place since the last update on September 19. On September 20, commands were sent for increasing the battery charge rate to C/4 and closing latch valves. The carrier signal was very low, intermittent, and carrier lock could not be maintained. After switching to the +Z LGA, no downlink signal was received. Commands were sent to the place the TWTA in standby and power on the propulsion tank primary heaters. No telemetry frames were received. On Friday, September 23, during the 70m track with DSS-43, the radio science team detected an extremely weak (~10 dB-Hz SNR) at 2200z for 15 seconds. The following Tuesday, September 27, during the 2 hour support with DSS-14, no downlink carrier was detected by the DSN after individually commanding and loading the test macro to power on the TWTA. The FDF received 17 tracking points labeled as 2-way. Residuals roamed between -200 and 1054 m/s, with a few points at similar levels. Mission Operations then directed DSN to begin configuring for automated battery recovery operations (i.e. repeated multiple sweeps in a 3 kHz range). At 1455z, automated battery recovery operations commenced, with MOC repeatedly commanding the following configuration through EOT - IEM switched power and 1553 off; TWTA to standby, primary and secondary propulsion tank and -Y panel (R4) heaters on. BEHIND observatory status: Low main bus voltage, 2 (#6 & 9) out of 11 battery cells are currently not functioning, high battery temperature, attitude uncontrolled, rotating at a ~45 second period about its principal axis of inertia. Current orientation support may support some solar array input; RF communications on the +Z LGA only supports uplink of short commands to an LGA. While propellant is suspected to be frozen, from the last telemetry received on Sep 18th, both propulsion tank latch valves are open, and pressure transducer #2 is not functioning. Power switching boards are on; nearly all switched loads off including the IEM (avionics) and PDU 1553 bus with the TWTA in standby and propulsion primary and secondary tank heaters on and -Y panel (R4) heaters on. EA mode is enabled. The battery charge rate is C/10. As the uncontrolled communications link is degrading, necessary macro sequences to allow the peak power tracker in C&DH standby mode to protect the battery will be loaded when the communications link supports. On Saturday, September 17, during an uplink array, which consisted of three 34m stations (DSS-24, 25, & 26) which provided an estimated 10.4 dB gain at the spacecraft over a standalone 34m uplink at 20 kW, 360 commands were sent for configuring the spacecraft for a low power mode by powering off excess loads, powering on all power switching boards, and ensuring the reaction wheels are powered off in a known configuration. On Sunday, September 18, during a 2nd uplink array with 70m station DSS-43 monitoring the downlink, during 2 brief TWTA sampling periods, the carrier signal was received on time with a continuously fluctuating signal of -170 dBm to -178 dBm with a period of ~45 seconds. Subcarrier lock was intermittent. While the uplink can support short critical commands, the downlink cannot support telemetry. The radio science receiver team reported a modulated downlink. As the SNR was not stable long enough for post-pass telemetry extraction, the LGA was swapped to the -Z LGA to improve SNR. This improved the carrier level by ~3 dB, with levels of -167 dBm to -174 dBm. Two telemetry frames were received. While the battery pressure was good, the temperature needs to be reduced. Daily two hour 70 m supports have been requested to prevent further battery functional degradation. Today, while the spacecraft was configured for switching to the +Z LGA and powering on the TWTA before the track this morning, no signal was received today after repeatedly attempting to power on the TWTA. As the spacecraft rotation will settle out about its principal axis of inertia which should continue to provide limited solar array input and communications, battery state of charge recovery has commenced today. As it appears that the momentum dump in EA mode was not as effective as we had hoped for during the STEREO BEHIND recovery into C&DH standby mode late Wednesday, it is suspected that battery voltage collapsed on Thursday due to sustained high wheel speeds. BEHIND observatory status: low main bus voltage, 2 (#6 & 9) out of 11 battery cells are currently not functioning, attitude uncontrolled. Current orientation supports some solar array input, with possible communications on an LGA. Late on Wednesday, September 7, a momentum dump maneuver was carried out on STEREO Behind. This reduced the spacecraft spin rate from once every two minutes to once every 38 minutes, approximately. At this lower rate, the star tracker managed to lock onto a guide star. Telemetry continues to be received. Mission operations personnel are working on improving the spacecraft attitude and fully controlling the spin. Over the Labor Day weekend, the mission operations team continued to work on recovering the Behind spacecraft. The primary emphasis has been on warming up the propulsion tanks and fuel lines, and on uploading macros in preparation for an upcoming maneuver to despin the spacecraft and get the solar panels fully pointed at the Sun again. The power system is stable, and the battery continues to charge up. Yesterday (September 5) an unexpected feature in the flight software autonomy rules brought the reaction wheels online for 1.3 hours, perturbing the spacecraft attitude. The wheels have been turned off, and indications are that the perturbations are damping down again. Today, during 4 brief TWTA sampling periods this morning, communications are still continuous with the carrier signal fluctuating between -158 dBm and -164 dBm. The battery charge rate increased to C/4 for approximately 4 hours during the track this morning increasing the battery pressure by ~50 psi. An autonomous momentum dump parameter was loaded, dumped, and verified to EA RAM and EEPROM and G&C EEPROM. Detailed power subsystem telemetry was received and cell #6 and #9 (2 out of 11 cells) are indicating 0 volts. Propulsion tanks are slowly warming and have increased by ~2 deg C. IMU2 was powered on briefly and initial indications show that it is healthy and was used to confirm the estimated system momentum level (high). 54 telemetry packets were received. From the Doppler data analysis by the FDF, the nutation is slowing and returning to the previous spin axis orientation. Progress continues on developing the plan and procedure to re-establish attitude control with very limited battery capacity by conducting an autonomous momentum dump in EA mode, powering on reaction wheels, and promoting the observatory to Standby mode. Five telemetry frames were received on Wednesday, August 31. With a good signal level, -159 to -164 dBm and a ~3 minute period, there was continuous communications with the TWTA on for 30 minutes. Subsequent analysis showed that the telemetry from the PDU was stale, so there was no sun vector. From the one sample, the battery appears to be charging with the TWTA on, with battery pressures 634 psi and 19 psi, and main bus voltage at 24.9v. As the uplink was good, the mission operations team began loading uplink time consuming commands to EEPROM, i.e., autoexec macro 1 and bad gyro data parameter to EA and G&C. The S/C emergency was reinstated (had ended at midnight) and a 6.2 hour DSS-14 support was added starting at 1815z. As the signal had sufficient margin, the downlink rate was increased to 35 bps, which provides one (1 packet/frame) every 102 seconds. Eight good telemetry frames were received, including 3 memory dump packets and one temperature packet. Unnecessary systems that were found to be on were turned off to decrease the load on the battery. The 3 loads to EEPROM were verified from dumps received. On Tuesday, Aug 30, the DSN once again detected the downlink carrier signal at 1321z from STEREO BEHIND. The signal was intermittent with a peak level of -159 dBm. FDF analysis of the Doppler residuals shows the signal fluctuating at ~140 seconds and a spin-axis to Earth angle of ~36 degrees. Note that the TWTA was only on for 30 minutes to conserve battery state of charge. A more stable uplink is required to load parameters necessary for conducting an autonomous momentum dump to re-establish attitude control. From Friday's IEM power on, four additional telemetry packets were processed (one was a duplicate) and will be distributed. The reaction wheel latching relays were commanded off along with all unnecessary power loads. The DSN detected the carrier signal again from STEREO Behind on the morning of Tuesday, August 30. More details to follow. The DSN has been able to extract 5 additional telemetry frames from Friday's IEM power on. These frames are being processed and the telemetry from the 5 critical packets will be distributed. An updated recovery plan was developed and discussed during the daily telecon. On Tuesday, carrier recovery will be commanded, attempting to power on the TWTA. If the downlink signal is detected, the TWTA on time will be limited to ~21 minutes, which is 1.5 times the period of the beat frequency of rotation and nutation. The reaction wheel latching relays will be commanded off. If no signal is detected, the battery recovery commands will be sent for the remainder of the support and the next dayâ€™s support will be shortened to 4 hours. This operational cadence will continue until BEHIND is restored to active attitude control or the DSS-63 time ends on Sep 11th. BEHIND observatory status: Unknown state of power, uncontrolled attitude, complex rotation (~14 minute rotation with the previous ~2 minute rotation) about the principal axis of inertia. Current orientation may support communication near the edge of the + Z LGA with some solar array input. Propulsion tanks are frozen. Today, the DSN created a new acquisition sequence for only sweeping a 3 kHz range about the best lock frequency. This was used successfully during the morning Goldstone support to repeatedly sweep and send battery recovery commands. It was agreed to continue battery recovery tonight and on a 4 hour support on Monday. The carrier recovery is scheduled for Tuesday during a 4 hour support with radio science receivers recording. BEHIND observatory status Unknown state of power, uncontrolled attitude, complex rotation (~14 minute rotation with the previous ~2 minute rotation) about the principal axis of inertia. Current orientation may support communication near the edge of the + Z LGA with some solar array input. Propulsion tanks are frozen. On Saturday, August 27, during the evening recovery track, no downlink signal was received after repeated commanding the transmitter on. Battery recovery commands were sent for the last hour of the support. On Friday evening, as battery voltage was decreasing from the three telemetry packets received, the transmitter was powered off early. However, the downlink signal was lost 6 minutes earlier than expected. It is speculated that with the complex roll, which resulted from powering on the IEM, the battery voltage may have collapsed at some point. The primary propulsion tank heaters (~30W) were enabled at 1530z on Friday, Aug 26. During the second track, after the IEM was powered, the downlink signal would drop out periodically. From analysis of the Doppler residual data from the FDF, the rotation is more complex, there is an ~14 minute rotation with the previous ~2 minute rotation. This appears to have shifted the spin axis from 10.5 deg to 22 deg. Three packets of critical telemetry were received. From this very limited data, as expected, the observatory is quite cold, with the battery at 30% state of charge and generating power to support ~150W. From the propulsion tank pressures, the tanks appear to be frozen; however, no temperature data were received. The Sun angle averaged ~ 60 degrees. As the main bus voltage was 24v and falling, the transmitter was powered off early. While early in recovery, 2 of 11 battery cells appear not to be functioning. Verified that the increased battery charge rate command to C/4 was received. From engineering team discussions, it was decided to power off the IEM and power on the secondary battery heater to allow the battery to recharge. The secondary propulsion tank heaters were also powered on to continue thawing of the hydrazine. BEHIND observatory status: Avionics off, uncontrolled attitude, complex rotation about the principal axis of inertia. Current orientation supports nearly continuous communication near the edge of the + Z LGA with some solar array input. Propulsion tanks are frozen. Secondary battery and propulsion tank heaters are on in between DSN tracks. Based on recent thermal analysis, the propulsion tanks will take from 65 to 308 hours, depending upon current temperature and how many heaters circuits can be used, to warm the hydrazine in the tanks to 2 deg C. As power is available now, the secondary propulsion tank heaters (~30W) have been enabled. Also, selected power switching boards were powered off to prevent unwanted loading in preparations for powering on the avionics. To allow for sufficient time for procedure testing and review, the powering on of the avionics has been moved to the second track on Friday. BEHIND observatory status: Avionics off, uncontrolled attitude, rotating about the principal axis of inertia. Current orientation supports continuous communication near the edge of the + Z LGA with some solar array input. No telemetry has been received and therefore detailed status is still unknown. Secondary propulsion tank heaters are on in between DSN tracks. The spin axis is estimated to be 12 to 14 degrees from the Earth-Sun line to spacecraft. Due to the 22 degree/year mean drift rate, the current geometry which provides solar input and continuous RF communications will not occur again till 2022. A separate analysis using the Doppler shift data was conducted by the RF lead and the FDF which was in close agreement with the G&C observations. It was concluded that the solar arrays are generating ~250W and loading during recovery must stay below this to prevent battery collapse. The draft plan for powering on the avionics (IEM) and G&C recovery was reviewed. Command procedures and testing on the hardware simulator are in progress. Correction: the principal axis of inertia, for which BEHIND is most likely rotating about, is located in the X-Y plane inclined about 60 deg away from the +X axis toward the -Y axis. A draft plan for powering on the avionics (IEM) and G&C recovery will be sent soon for review. After reviewing the downlink signal levels, it was concluded that STEREO Behind is most likely rotating about its principal axis of inertia, located in the X-Y plane inclined about 30 deg away from the +X axis. While this uncontrolled orientation appears to be power positive now, it will drift off, and the estimate is that it may not return until next summer. The ~2 minute rotation/wobble is ~3 deg/sec which is beyond what the momentum wheels can handle. This means that any attempt to despin the spacecraft at the present time would result in saturation and subsequent autonomous momentum dump, for which the spacecraft has not yet been prepared. The FDF will generate a new orbit when sufficient data is available. For subsequent tracks, will go two-way as soon as possible to collect more coherent data. On Sunday, August 21, contact was reestablished with the STEREO Behind spacecraft for the first time in 22 months, since contact was lost on October 1, 2014. See this news release for more information. During the monthly recovery operations, the Deep Space Network station DSS-14 established lock on the STEREO Behind downlink carrier at 2227z on Sunday, Aug 21st. The two-way downlink signal was -168 to -178 dBm, over what appears to be a ~2 minute rotation. The Doppler residual frequency was in the predicted range. The DSN locked to the 25 kHz emergency subcarrier frequency indicating that the observatory was transmitting on the low gain antenna as expected. The DSN radio science receivers were recording and the team confirmed the spectrum of the carrier, the residual frequency, and the subcarrier. The downlink was received for 2.4 hours through end of track. NASA project management has reinstated the spacecraft emergency for STEREO Behind. A 3 hour support with DSS-43 commenced later with an improved one way signal of -158 to -168 dBm. The best lock frequency range was determined and the transmitter high voltage was powered down, on the A side on the first command sent, to save battery power. No telemetry was received as expected since the avionics were purposely powered off to maintain battery state of charge. While quite early, recovery is expected to proceed slowly to preserve a positive power balance, assess observatory health, re-establish attitude control, and warm all subsystems and instruments. The STEREO Ahead observatory has returned to full operations on the main lobe of the high gain antenna. The low rate data stored on the recorder since the start of side lobe operations has been read out, and the recorder has been restored to its original configuration. All the instruments have resumed normal operations. The IMPACT SWEA and STE detectors will be powered on and brought back up to full operations over the next few days. The STEREO Ahead observatory has returned to using the main lobe of the high gain antenna. From this point on, space weather beacon data will be available again from the NOAA antenna partners between DSN tracks. The mission operations team will now start to download the low rate data that was stored on the recorder since the start of side-lobe operations on August 20, 2014. Once this is completed, the recorder will be reconfigured, and the instruments will be returned to their prime science mode. In the meantime, the instruments will continue to produce telemetry at the side-lobe rates for the next few days. See the planning page for more details about the schedule. The spacecraft guidance-and-control system was returned to normal operations when reaction wheel #3 was power cycled and resumed responding to torque commands. The IMPACT team reports that all of their instruments are now working and producing science data, with the exception of SWEA and STE which won't be turned on until the spacecraft returns to the main lobe of the high gain antenna in November. Because of the current difficulties with commanding due to solar scintillation effects at such a small separation angle from the Sun, the SIT instrument is using the original table set that the instrument was launched with. This table set is known to have some calibration problems, but this is considered to be better than having no data at all. He intensities are about a factor of five too low, while the H, O, and Fe intensities are approximately correct (within a factor of two). The IMPACT team plans to upload the most current table set when the command link is more stable, which is expected to be in several week's time. JPEG images from the SECCHI EUVI and HI2 telescopes are now appearing on the SSC website. Images from the other telescopes will be made available as soon as enough data have been collected to derive instrumental backgrounds. The SECCHI team is also working through the issue of updating the pointing information in the images to take into account the changed attitude of the spacecraft after solar conjunction. The headers in the COR1 and COR2 FITS files have been corrected, and work is proceeding on the other telescopes. Incorrect EUVI pointing information is currently interfering with the production of heliographic maps. It is expected that this will be corrected soon. The IMPACT team reports that MAG, SEP, and HET are producing science. Regular science data from SIT-A from July 13 after the HV was ramped up showed that the instrument MCPs were triggering normally, and events were being analyzed. However, the on-board rate computation was returning 0 counts in all boxes, due to the dropouts in the table loads experienced on July 13. Given the current issues with dropped commands due to solar interference, it was decided to reboot SIT-A, since this loads the original table set from SEP central. This table is not optimally calibrated, but approximately calibrated data is better than no data at all. The team's plan is to upload the up-to-date table set when the STEREO commanding link is more robust, perhaps on August 1st, when the SPE angle is at 3.0 degrees. The PLASTIC MCPs have been brought up to 2590V, which was the original operating voltage at the beginning of the mission. The PAC was brought to -18kV, monitored for stability, and then brought to the full mission operating value of -20kV. The instrument was then put into mode 3 to collect monitor rates. The entrance system is not yet enabled. On Saturday, Jul 11, the SECCHI instrument was powered back on. The team verified with the EUVI telescope that the spacecraft was correctly pointed, and re-opened the COR1 and COR2 doors. All the telescopes are operating normally, but some ground software issues are currently interfering with the production of JPEG images for the SSC website. The IMPACT team reports that HET is now producing science. Due to solar interference, efforts to patch LET have been slowed. The SIT-A high voltage ramp-up was completed today, and the analog HK values from the instrument are at nominal levels. The largest of the lookup SIT tables has not been successfully reloaded, apparently due to ground GSE problems, but the smaller SIT tables have now been loaded. PLASTIC continues to ramp up their high voltages. The IMPACT team reports that MAG and SEPT are producing science. Due to communication interference, efforts to patch LET have been slowed and will continue on Monday. HET is producing some science, but a table load needs to be completed on Monday to get back to its nominal state. SIT has a bit more configuration to do as well plus its high voltage needs to ramp up so it will be sometime next week before it is producing science. All these instruments appear to be healthy. No anomalous behavior has been seen after the long conjunction period. Post-solar-conjunction instrument recovery continued with the powering on of the IMPACT and PLASTIC instruments. The IMPACT MAG, SIT, HET, LET and SEPT subsystems have been powered on. SWEA and STE will remain off until the spacecraft returns to the main lobe of the high gain antenna later this year. MAG has already started producing science data. The SEP suite is expected to be in science mode sometime on July 10, except for SIT which will take several more days to bring back to full operating mode. The STEREO Ahead spacecraft was returned to three-axis stabilized mode today, and the operations team has started the process of returning the spacecraft to normal operations. The scientific instruments are expected to be turned on over the next few days. The S/WAVES radio instrument has remained on all throughout the superior solar conjunction period, and has started to return real-time data again. More information on the status of STEREO Ahead will be provided as it becomes available. A simulation of one possible model of the events that led up to the loss of contact with STEREO Behind is available here. The STEREO Ahead was reset into its "safe mode" 16:00 UT on 24 March 2015 in preparation for superior solar conjunction. Normal operations are expected to resume in July 2015. Please see this link for more information. The IMPACT, PLASTIC, and SECCHI instruments on STEREO Ahead were turned off at 16:00 UT on 20 March 2015 in preparation for superior solar conjunction. They are expected to resume operation in July 2015. A new Level-2 data product for the SECCHI HI telescopes from the Southwest Research Institute in Boulder, Colorado is now available on the SSC website. See the description here for more information. The SWAVES plots on the STEREO browse plots pages have been replaced with a different set of plots combining data from both the WIND and STEREO missions for all dates past the start of side lobe operations on Ahead on 20 August 2014. This was done because this newer data product combines data from both the space weather beacon and SWAVES-prime telemetry streams to provide more complete coverage for STEREO Ahead. A new web page has been put together describing the recent loss of contact with the STEREO Behind spacecraft. Communications with the STEREO Behind spacecraft were interrupted on October 1, immediately after a planned reset of the spacecraft performed as part of a test of solar conjunction operations. The cause of the anomaly is not yet known, though a sensor anomaly in the guidance and control system is suspected. Attempts to recover the spacecraft are continuing. A massive proton storm caused by a large flare on the far side of the Sun hit both STEREO spacecraft starting September 1, 2014. The high energy particle fluxes were so high that the star tracker reset on both spacecraft reset within minutes of each other. The star tracker on Behind returned to full operation after 4.7 hours, and on Ahead after 18.7 hours. Both star trackers are now operating nominally. The storm was so massive that many of the SECCHI images during the storm do not pass their quality check, and therefore do not appear on the daily browse pages. Other images from the storm period that do make it onto the web pages are heavily contaminated by the proton storm, and are highly distorted. This is particularly true for the HI-1 and HI-2 images taken during the height of the storm. A new procedure has been developed for processing HI-2 images during side lobe operations. The old procedure depended on having pairs of images 2 hours apart, in a process known as "running difference". This worked fine when we were getting 24 hour coverage. However, now that the Ahead spacecraft is operating on one of the side lobes of the high gain antenna, we only get a few hours of real-time data per day, during the periods when the spacecraft is in contact with one of the 70 meter ground stations. With such restricted telemetry, only a small number of HI-2 images has a preceeding image to form the running difference. The new technique uses nearby images to generate a background image for subtraction, and allows all the images to be processed. Experimentation shows that coronal mass ejections still show up in these images, though not quite as clearly as in the running difference technique. Behind data will continue to be processed as running differences until that spacecraft also starts using the antenna side lobe at the end of November. For more information about the STEREO side lobe operations, please see this important notice. The first telemetry downlink from the STEREO Ahead spacecraft during the side-lobe operations period has been carried out successfully. Beacon data was collected from all the instruments, and processed for the real-time image and plots pages. There are some minor issues which have been identified in the ground processing of the SECCHI images in this new mode of operations, but they should be corrected soon. The spacecraft performed as expected. For more information about the STEREO side lobe operations, please see this important notice. The STEREO Ahead spacecraft has been reconfigured for side lobe operations. The solid state recorder has been played back, and repartitioned to store spacecraft housekeeping and in situ beacon telemetry for eventual playback once normal operations are resumed in January 2016. The high gain antenna has been moved to the first side lobe position; the first pass using this configuration will be on Wednesday, August 20. See this important notice for more information. The change in COR1 processing implemented on August 14 did not work out as expected, and the software has been returned to its previous behavior. However, the initial backgrounds for the most recent COR1-Ahead data have been improved. Because of the difficulty in deriving good instrumental backgrounds at this stage of the mission, the strategy for generating the browse images for the COR1 telescopes has changed. In the old procedure, regions where the instrumental background was overestimated would end up completely dark. The new procedure should correct this problem, but with the side affect that some areas in the outer corona may now appear too bright. However, it was felt that this was preferable to completely losing visibility in parts of the image. It's anticipated that after sufficient time has elapsed to provide better backgrounds, and the images have been regenerated, the difference between the two methods will be minimal. The test of operating the STEREO Ahead spacecraft during the upcoming period of reduced operations has been successfully concluded. Recovery of the science instruments after being off for the last several days has begun. A test of operating the STEREO Ahead spacecraft in this antenna off-pointed mode will be conducted during the week of July 6-12, 2014. All science instruments will be turned off during this time, and instrument recovery operations are expected to take several days. More information about the upcoming period of reduced operations can be found on this page, which will be updated as more information becomes available. A new version of the SECCHI/HI Level-2 product is available on the STEREO Science Center website. These data have have actually been partially available for a while now, but announcement was delayed until the ingestion of the files was mostly complete. At the time of this writing, some data from the first year of the mission is still being ingested, but the data should be complete from 2008 onwards. The new data are available in three different units: detector data numbers per pixel per second (DN/Pixel/Sec), Mean Solar Brightness (MSB), and the astronomical diffuse magnitude scale known as S10. The MSB and S10 data have had the diffuse brightness correction applied. The file naming convention has been updated for these data. The Inertial Measurement Unit (IMU) on STEREO Behind failed at 9:46 UT on Sunday, January 5, putting the spacecraft into coarse point mode. Recovery operations are currently being carried out. All the instruments continue to take data. However, the COR1 and COR2 doors are closed. Update: Fine pointing mode has been restored on STEREO Behind. The COR1 and COR2 doors have been reopened. A page describing possible roll maneuvers has been added to the discussion about the planned Comet ISON observations. The STEREO Behind spacecraft has been completely recovered, and is operating nominally. The cause of last week's transponder anomaly is still under investigation. The STEREO Behind spacecraft is currently in a low-rate telemetry mode. The mission operations team is diagnosing the problem. More information will be posted as it becomes available. Update:The The transponder on the STEREO Behind spacecraft has been recovered back into 120 kbps mode. The remaining recovery activities, including activating the beacon rate between passes, will be completed on the next pass. The rest of the spacecraft has been operating normally the entire time, and the instruments have been collecting data. A new web page has been put together describing the possible observations of Comet ISON by STEREO in October-December 2013. The mode of operations for the COR1 telescope on STEREO Behind was changed back to the normal sequence of 0, 120, and 240 degrees. Starting November 29, the mode of operations on the COR1 telescope on STEREO Behind was changed to take images at polarizer angles of 60, 180, and 300 degrees instead of the previous 0, 120, and 240 degrees. This was done in an attempt to correct occasional position errors that had developed in the 240 degree images. Changing the polarizer angles introduces subtle effects in the instrumental background. It will take some time for sufficient data to be collected to create new background files. In the meantime, provisional background files have been formed based on the older data. As a result, the COR1-B images will appear noisier than usual until new background files are available. Users may have noticed that there have recently been a significantly smaller number of SECCHI images from the Behind spacecraft, and large gaps in the IMPACT, PLASTIC, and SWAVES data from Behind. This is due to a shortage of telemetry coverage caused by Deep Space Network schedule conflicts with other missions. This situation started in mid-November 2012, and is expected to continue for the next several months. In upcoming weeks, the Ahead spacecraft will also start to be affected. The Where is STEREO? page has been updated to include a link to a discussion of out-of-contact periods of 2015 when the two spacecraft pass behind the Sun. The daily STEREO browse images pages now include daily synoptic maps generated from a combination of STEREO and SDO images, in all four EUVI wavelengths. These daily maps have been generated back through 2010, and earlier dates will be available soon. A new searchable STEREO publication database is now available. This replaces the old database system which had to be taken offline. Authors of STEREO-related articles in the refereed literature are encouraged to submit them for inclusion in the database once they are accepted for publication. It would be particularly helpful to include the DOI, volume, and page number. A new running difference browse product is now available for the SECCHI EUVI, COR1, and COR2 telescopes. These running difference images are available on the individual daily browse pages, and on the latest images page, and should be available soon via the image search tool. Currently, running difference images are available only for dates starting November 1, 2011, but earlier dates will be filled in over time. The power outage earlier reported on the home page for July 22-23 has been canceled. The software used to generate the SECCHI browse images has been changed to more closely reflect the actual data. In the previous version of the software, when the JPEG images being generated were larger than the original images, the data were interpolated to the larger size. The new version of the software resizes the images without interpolation. The result is a less-smooth, more "pixelated" image, but which is more representative of the actual data. Particularly affected are the beacon images. The smoother beacon images produced by the previous version sometimes confused people into thinking that they saw structures which were not supported by the actual data. The SECCHI EUVI, COR1, and COR2 telescopes on STEREO Behind picked up an interference pattern on 9 May 2011 around 17:20 UT, thought to be due to a single event upset to the Camera Electronics Box (CEB). The CEB was restarted to fix the problem on 12 May 2011; however, in the meantime the background images for COR1 and COR2 had become corrupted, preventing the team from immediately realizing that the problem had been solved. New backgrounds are now being produced, and the browse images are being regenerated as corrected backgrounds become available. A new "Downlink Performance" data product is now available as part of the Ancillary Data set. The IMPACT/PLASTIC Data Processing Unit on Behind was autonomous switched off on 8 January 2011 due to unexpectedly high current. The IMPACT and PLASTIC instruments were switched back on, and all the instruments are now back into normal operating mode. The SECCHI team is now making available movies made up from the last seven days of data. These movies are available from their Synoptic Movies page, under the sidebar heading "Current Weekly Movies". Note that each STEREO spacecraft is now within the field of view of the COR2 telescope on the other spacecraft. The PLASTIC team has instituted a new data browse product called "Protons Projected to Earth" on their data plots page. These overplot the STEREO A, B and Wind proton data sets, with a simple time translation assumed for A and B. The purpose is to demonstrate how STEREO-B data can be used as an advance proxy for L1. The remaining problems with connectivity between the STEREO Science Center and the Mission Operations Center after the move on November 29 have been resolved. All SSC services should now be functioning normally. The STEREO Science Center has been successfully moved to its new location, and the website and beacon services are back up and running. SECCHI/HI Level-2 data are now available. The PLASTIC Level-2 data set for Iron now includes CDF files. Plots of the PLASTIC Level-2 Iron data are now organized into two classifications: the previous plots of charge states and the new plots of monthly abundances. We are now making available a prediction of the state of the Sun during the upcoming total solar eclipse on 11 July 2010, based on what STEREO Behind saw at the same heliographic longitude on 6 July 2010. The problem with accessing recent AIA data for the STEREO synoptic maps has been resolved. We are currently having problems accessing recent AIA data for the STEREO synoptic maps. The VSO and AIA teams are working on the problem, and we hope to have it resolved as soon as possible. A new browse product displays the STEREO in-situ data as a function of Carrington rotation number. SDO/AIA images are now being used to supply the "Earth-view" in the STEREO Latest Images and Daily Browse Images pages for dates after April 16, 2010. SOHO/EIT images are used for earlier dates, or if the SDO/AIA data are unavailable. Since AIA does not observe the Fe XV line at 284 Angstroms, the similar Fe XIV image at 211 Angstroms is used instead. Note that the SDO/AIA team has chosen to display their images in different color tables than were used for the SOHO and STEREO projects. The STEREO heliographic maps on our Latest Images page now include SDO/AIA data for the Earthward-facing part of the Sun. Once the two STEREO spacecraft reach 180 degree separation on 6 February 2011, the combination of images from all three spacecraft will give us a complete view of the entire Sun. Additional changes have been made to the PLASTIC archives. The Iron Level-2 subdirectory has been split into separate plots and text subdirectories. A new Level-3 tree has been created with suprathermal event lists and He+ relative fluxes. The PLASTIC Level-2 archive has been reorganized. The former contents have been moved to a new subdirectory called Protons, and new subdirectories Alpha_RA, and Iron, have been added. The pages on image artifacts due to beacon processing and cosmic rays have been updated to show how these two artefact sources interact. A new webpage has been inaugurated showing side-by-side comparisons between the latest SECCHI beacon images, and the most recent GONG far-side maps. When candidate magnetic regions appear in the GONG maps, one can look for enhanced brightness in the corresponding area in the EUVI maps. There is still a region on the far side of Sun which is not yet observed by STEREO, but this region will shrink over time, and we should be able to observe the entire Sun by February 2011.
and the same for behind. MAG data are now to be found in the RTN and SC directories for data in RTN and spacecraft coordinates respectively. We have been receiving a number of questions recently about planets visible in the STEREO telescopes. A new STEREO Planet Finder page shows the calculated positions of planets in the latest SECCHI beacon images. One can also use the STEREO Orbit Tool for older data. Select either the inner or outer solar system options to see which planets might be in the field of view of the STEREO telescopes. The SECCHI instrument team has instituted new software for their HI2 beacon images. These images are now available on the latest images and daily browse pages. To save telemetry, only the sunward half of the images are sent down in the low rate beacon telemetry stream. IMPACT/PLASTIC Level-3 event lists from UCLA are now archived within the SSC. The IMPACT/SIT instrument has now been restored to full operation. Now all the STEREO instruments are recovered from the system reset on August 4. The IMPACT/SWEA high voltage on Ahead is now at its nominal value. The only remaining detector still needing to be fully recovered is IMPACT/SIT. PLASTIC on Ahead is back to operating mode. The high voltage supplies are still warming up, and are expected to take several hours to reach equilibrium temperatures. This may affect the data values during those hours. The SECCHI telescope suite has been recovered, and is taking images again. All the instruments have been powered back on successfully. Some beacon telemetry is now available from IMPACT and SWAVES. Instrument recovery will continue over the next few days. Powering up of the instruments has begun. The STEREO Ahead spacecraft was successfully reset today (Aug 4) to load new guidance and control software. The spacecraft is back on the high gain antenna, and recovery is proceeding as scheduled. Powering up of the instruments is expected to begin soon. The instrument start preparations for shutdown at 5:45 UT. High voltages will be ramped down. Instruments will be powered down at 9:40 UT. The spacecraft will be commanded to reset around 10:30 UT. Powering up of the instruments is expected to commence around 15:50 UT. Pass ends at 17:40 UT. Instrument recovery will continue over the next couple of days. PLASTIC Level-2 data are now available in ASCII format. The PLASTIC Level-2 directories have been reorganized. Under the directories for each spacecraft now appear directories labeled "10min", "1hr", and "1min" for different time resolutions. The previous data appear in the "1min" directory tree. The STEREO website has been restored. There are still a few features which are disabled, but most things should work. In particular, the popular image search utility is working again, as is the orbit tool. We are endeavoring to restore the remaining features as quickly as possible. The STEREO/VSO interface, which went offline along with the webserver on June 22, is back online. STEREO data can now once again be retrieved either through the web interface, or through the IDL interface (recommended), such as through the routine secchi_vso_ingest.pro. Time-elongation plots of SECCHI beacon data are now available. These plots are designed to show the propagation of CMEs through the telescope fields of view. The data and browse directories have been restored to the website, but scripts are still not functional. The STEREO Science Center website went offline on June 22, 2009. Currently, we're running a minimal website with some, but not all, of the functionality of the original website. Please excuse us while we try to address the problem. We have been informed that all instruments have now been completely recovered from the planned spacecraft reset on May 12, 2009, including ramping up high voltages. The STEREO Behind spacecraft was successfully rebooted on May 12, 2009 to use the new Guidance and Control software. Recovery of the spacecraft has been completed, and all instruments have been powered up and are operating. High voltages on some of the instruments may still require adjustment. Starting around 23:00 UT on May 12, 2009, the STEREO Behind spacecraft will be reset to load a new Guidance and Control software version. Full recovery of all the instruments is expected to take several days. Please check the status page for updated information as it becomes available. Initial processing of COR1 images was changed in an attempt to bring out more of the solar features before the preliminary time-dependent background subtraction has settled down to its permanent value. Later processing of the COR1 images, at 15 and 35 days after the observation date, uses the original method. This new procedure turned out to be unsuccessful, and was removed. The PLASTIC team now provides solar wind proton data as "condegrams", showing five Carrington rotations at a time in a spiral format. This brings out recurrent features (such as CIRs), and shows changes in magnitude from one Carrington rotation to the next. These plots are available from our instrument data page. The SSC is now providing heliographic maps formed from the latest SECCHI Ahead and Behind EUVI images to provide a more integrated view of the current state of the Sun. The synoptic map, updated hourly, can be found on our latest images page. Note just how much of the Sun we can see now. A new IMPACT/SEPT data browser has come online at the University of Kiel, Germany. The IMPACT SEPT files have been reprocessed to remove the timestamp bug. The corrected files are version V06 and above. SEPT files below version V06 should not be used. Updated Warning: A software bug has been discovered causing times in the IMPACT SEPT Level 1 data to be too early by about 33 seconds. The IMPACT team is in the process of correcting the files and appreciates your patience. They have verified that the problem exists only for the IMPACT SEPT level 1 data. No other IMPACT data products, including products for MAG, SWEA, STE, LET, SIT and Beacon, are affected. Warning: A software bug has been discovered causing times in the IMPACT CDF files to be too early by about 33 seconds. The IMPACT team is in the process of correcting the files and appreciates your patience. They have verified the problem exists for the IMPACT SEPT and Beacon data files and may also be present for several other IMPACT Level 1 data products. The times are known to be correct for the LET Level 1 data product. Although some technical problems may still need to be worked out, data ingestion from NRL has resumed. The most recent data has been ingested, but some backlogged data is still being copied over. Because of server problems at NRL, the processing and ingestion of SECCHI FITS data is temporarily suspended. A new IMPACT/PLASTIC Level 1 data product including data from the 200h housekeeping packets is now available on the SSC server for both ahead and behind. Ingest of SECCHI data into the Stereo Science Center was resumed on Tuesday, August 12. The backlog of data has now all been ingested and processed into images. Ingest of SECCHI data into the Stereo Science Center has been temporarily suspended until additional disk space can be installed. Data ingestion is expected to resume on Tuesday, August 12th, 2008. All other data products continue to be ingested. The first announcement for the combined STEREO-3/SOHO-22 Workshop, "Three eyes on the Sun - Multi-spacecraft studies of the corona and impacts on the heliosphere", is now available. Information about STEREO plans for the solar eclipse of August 1, 2008 is now available. IMPACT/PLASTIC Level-3 event lists are now available from UCLA. This and other event lists are available from our new events page, as well as our instrument data pages list. Automated detection of CMEs from STEREO/SECCHI data is now available as part of the SEEDS: Solar Eruptive Event Detection System from the George Mason University Space Weather Lab. The STEREO proposal to the 2008 Senior Review is now available from our publications page. The PLASTIC level-1 data archived at the SSC have been moved down into a new level1 subdirectory to make way for new level-2 data which are now available. Daily browse movies are now available from the CDAW Data Center. This website allows one to examine side-by-side images from STEREO Ahead and Behind, or from two SECCHI telescopes on the same spacecraft. Normal operations have resumed on Behind, one day earlier than originally expected. Both spacecraft are now operating as expected. The Behind star tracker has continued to perform nominally since December 23. Should no further problems develop, Mission Operations plans to resume normal operations on Friday's track (Dec 28). The Mission Operations team was able today to command the star tracker on Behind back into operational mode. The star tracker continued to operate throughout the track. As a precaution, use of the star tracker was suspended at the end of the track, and the spacecraft was switched from the high gain to low gain antenna. Mission Operations will continue to staff tracks, and proceed with caution regarding ST usage. Contingency planning will continue as will discussion with the star tracker supplier. Problems persist with the star tracker on Behind. The high gain antenna continues to point to Earth, and the Mission Operations team was able to use it to download science telemetry. All other spacecraft systems continue to operate normally. The star tracker on STEREO Behind had an anomaly at 10:10 GMT this morning. This resulted in the spacecraft autonomously switching to the low gain antenna. All other spacecraft systems are healthy. Diagnostic telemetry is being collected, and corrective action is under consideration. Science data is still being collected, but at the current low telemetry rate it is not possible to send it to the ground. Some science data may be lost when the onboard recorders reach their maximum capacity. Running difference images and movies from the SECCHI Heliospheric Imager HI-2 telescope are now available on the SSC browse and image search pages. So far, only a few days are available, mostly in December 2007, but more days will be populated in the near future. Unlike the other SECCHI telescopes, the HI-2 images are only processed from the full resolution level-0 science data. Thus, there is a delay of several days before any HI-2 images are available. Data from the IMPACT STE detectors are now available on the SSC archive. Realtime SWAVES radio beacon plots are now available on the In-Situ & Radio Space Weather Beacon Data page. The STEREO Journal Publication Database is now online. Users are encouraged to submit published journal articles involving the STEREO mission for inclusion in the database. Realtime SECCHI HI1 telescope images are now available on the Latest SECCHI beacon images page. Daily MPEG summary movies are now available from the Daily Browse page. Images from the SECCHI HI1 telescope are now available on the Daily Browse and Image Search Tool pages. Because the HI1 images are derived from the level-0 science data, they take a few days to appear on the website. IMPACT Level-1 data files are now available. Images from the SECCHI COR2 telescope are now available on the Latest SECCHI Beacon Images page. As they become available, these images will also appear on our Daily Browse and Image Search Tool pages. Images from the SECCHI COR1 telescope are now available on the Latest SECCHI Beacon Images page. We hope to add images from the other SECCHI telescopes soon. As they become available, these images will also appear on our Daily Browse and Image Search Tool pages. Several improvements have been made to the in-situ beacon pages at http://stereo-ssc.nascom.nasa.gov/beacon/beacon_insitu.shtml. The IMPACT magnetometer data is now in the standard Radial-Tangential-Normal (RTN) coordinates, and total magnetic field strength has been added to the plots. New pages have been added for solar energetic particle data. The daily data browse pages are now available at http://stereo-ssc.nascom.nasa.gov/browse/. So far, only a few days worth of data are available, but earlier data will be steadily added. We're also working on adding more in-situ data, as well as the daily summary plots from SWAVES. Realtime beacon in-situ plots are now available at http://stereo-ssc.nascom.nasa.gov/beacon/beacon_insitu.shmtl. SWAVES data is now archived within the STEREO Science Center at http://stereo-ssc.nascom.nasa.gov/data/ins_data/swaves. 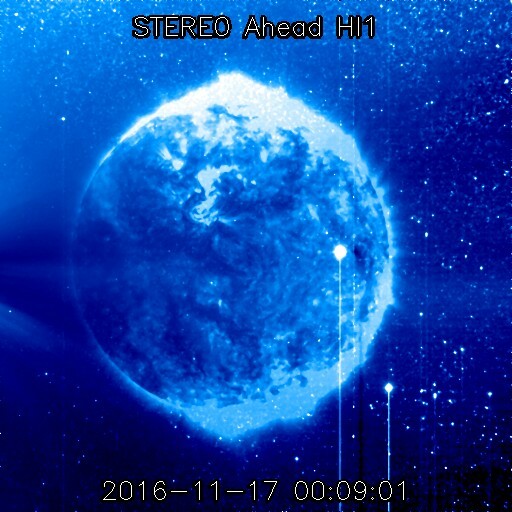 Real-time space weather beacon images from SECCHI are now on-line at http://stereo-ssc.nascom.nasa.gov/beacon/beacon_secchi.shtml. SECCHI and PLASTIC science data are now available through the Virtual Solar Observatory. New web page for auxiliary data, which is data produced by other observatories either in conjunction with the STEREO project, or which is useful for analyzing STEREO data. The Behind spacecraft flew by the Moon for the second and last time on January 21. Both spacecraft are now in heading away from Earth into their orbits around the Sun. The official science mission started January 22. The baffle cover on the SECCHI Heliospheric Imager on Behind was opened on January 11. The scientists were thrilled to find that Comet McNaught was in the HI-1B field of view. The IMPACT SIT and SEPT covers were opened on Behind on January 16. All instrument covers are now open. The A spacecraft performed its lunar flyby last Friday and is now in heliocentric orbit.Ã‚Â The drift rate of the spacecraft is +21.66 degrees/year (relative to the earth), this is well within its specification of 22+/- 2 deg/year. The B spacecraft also performed a lunar flyby, but its trajectory has another flyby scheduled for 21 January 2007.Ã‚Â The B spacecraft successfully completed its final trajectory adjustment maneuver on this Thursday. All the subsystems on both spacecraft continue to perform very well.Ã‚Â On Monday, Dec. 11, the Ops team performed a peak power test on the A-spacecraft.Ã‚Â The arrays are producing slightly more power than expectedÃ‚Â (720W vs 690W).Ã‚Â The G&C team has started to tweak the control algorithms with the result that mechanical oscillation of the SWAVES antennae has completely disappeared on both spacecraft.Ã‚Â They will continue to fine tune the system and are planning a test which would run all the wheels through all speeds to investigate the effect of wheel speed on jitter. The SECCHI SCIP-B telescope doors (EUVI, COR1 and COR2) were successfully opened Dec. 13 at 6:30am. First light images were taken and reviewed by a bunch of very happy scientists on the east and west coasts. Ã‚Â Performance was as expected and comparable to the SCIP-A telescope images taken last week. In addition, there was a successful opening of the first HI telescope door on S/C-A. The HI images appear to be exceptional. This means that of the 10 SECCHI telescopes, 8 have successfully opened their doors and taken good images. The HI-B door, which covers the last 2 telescopes, will open at the end of December or early January, depending on when we verify that there will be no more B Observatory maneuvers. The IMPACT SEPT-NS, SEPT-E and SIT doors were deployed Dec. 14 on Ahead. In anticipation of this exciting event, the Sun decided to become active making it easy to confirm the door openings in the science telemetry. There were 5 door actuations - one for SIT and two for each set of doors on SEPT-E and SEPT-NS. The door deployments for SIT, SEPT-NS and SEPT-E on Spacecraft B will be in mid January. The SECCHI team opened the doors to the SECCHI SCIP-A instruments and took a few first-light images. Everything went absolutely smoothly. The three doors opened without incident. The first images look great even though they were sent down highly compressed to keep the downlink time reasonable. The EUVI was opened first and an image from each of the four quadrants looked fine - no major tears or pinholes in the front filters. The sun is close to being in the center of the CCD, and the resolution is beautiful. Then we opened COR2 and took an image--also beautiful, although there is a slight offpoint (which we expected). The exposure time is just about where we expected, about 3-4 seconds. We then took a pB sequence of 3 images with the result that streamers could be seen all the way to the edge of the field. Then COR1 was opened and it was also as expected. A pB sequence shows the inner corona nicely out to about 2.5 R, which is what we expected. Both the Ahead and Behind spacecraft performance continue to perform very well with all subsystems nominal. The instruments on both observatories continue to perform well. The SECCHI instrument team is planning to open the doors on the STEREO-A coronagraphs next week and is completing internal tests. The definitive orbit solutions from FDF indicate that the STEREO A Observatory will achieve its required drift rate without further maneuvers. The STEREO B Observatory will require a 0.2m/s maneuver currently scheduled approximately December 8th. Both spacecraft will swingby the moon on December 15th, with a second lunar swingby for STEREO B on January 21st. The guide telescope has been enabled on both spacecraft. G&C is assessing the performance of the attitude control algorithms and will upload new parameters in December. The SWAVES team is now producing daily summary plots through their website at http://swaves.gsfc.nasa.gov. Follow the links to "data" and then "data plots". Both the Ahead and Behind spacecraft performance continue to perform very well. So far, all the planned maneuvers have been completed successfully. The Mission Operations team is studying the current orbit of the Ahead spacecraft to see if any more orbital maneuvers are necessary. At least one more delta-V maneuver is planned for the Behind observatory. The instruments on both observatories continue to perform well. They were powered down prior to the P2 maneuvers and then powered back on successfully. The SEP Central, HET, LET, SIT, SEPT-E, SEPT-NS detectors on IMPACT have been successfully been powered on and checked out on both observatories. The Caltech team was able to correlate the first 100 minutes of data from the STEREO LET instrument on IMPACT with ACE data and the spectra were found to be consistent. A spacecraft roll to calibrate the IMPACT Magnetometer was performed on each observatory. Initial results show that the test was highly successful. PLASTIC continues to ramp up their high voltage levels on their MCPs. At the current HV levels they are starting to see counts from penetrating particles or photons on their position detectors. The SSDs are also seeing penetrating particles and photons. The SECCHI team has completed their decontamination heating of the CCDs on the COR1 and COR2 telescopes and are preparing to do the same with the EUVI and HI telescopes. All the spacecraft subsystems are performing very well. The Guide Telescope was enabled on the A spacecraft Sunday and acquired the sun. The GT on the B spacecraft was enabled Monday. In both cases the GT data looks good and the spacecraft algorithms are correctly using the data. The spacecraft pointing improved markedly with the GT enabled. There are more planned tests of the GT and spacecraft control algorithms in December and more tweaking of the control algorithms. A complete functional test of the both SECCHI suites was completed at the end of last week and both suites are working well. The SEP instruments on the B spacecraft were turned on for the first time this afternoon. Initial indications are very good. Both spacecraft went through a 25 minute eclipse as they went through perigee this morning. The spacecraft behaved nominally throughout eclipse and are now on their way out to moon radius. The Ahead spacecraft was intentionally sent to Earth Acquisition mode in order to test the EA system. The operation of the spacecraft was completely nominal in EA and recovery from EA to Standby was nominal. The instruments on the A spacecraft were turned off as part of the EA test. The instruments were turned back on and are continuing with commissioning activities. The PLASTIC SSD high voltage has been turned on both spacecraft. The MCP high voltages have been turn on at low voltage on both spacecraft. The MCP voltages will be ramped up to operational voltages over the next month. This is STEREO's second week in Earth orbit(s). It is still in it's first of four phasing orbits--prior to the first lunar swingby. So far the planned commissioning activities have occurred without any serious anomalies. The major deployments of solar arrays, spacecraft separation, and high gain antennas occurred almost immediately after launch. Since then, the SWAVES antennas on each observatory have been deployed -- and SWAVES started producing significant science data. This week, the significant commission events were the execution of the apogee propulsive maneuvers on both spacecraft that raised their perigees to altitudes that are comfortably above the atmosphere. These 'burns' were accurate to within 0.5% -- that is considered very good considering that the observatories have not yet been fully characterized. The other significant event was the deployment of the four meter rigid IMPACT boom on each observatory. The MOPS and Engineering teams performed other important activities: 1) the High Gain Antennae were successfully exercised over their full range of motion on both spacecraft. 2) The software team completed its assessment of observed SEU bit flips on the C&DH and G&C computers and uplinked a patch (after a change control board review) to correct an issue in the memory scrub software. Currently, both observatories are operating nominally. All subsystems and instruments on both observatories have a GREEN health status. Some IMPACT detectors are currently saturated, possibly due to the proximity to Earth. This effect is still being investigated. MAG is seeing higher than expected offsets, which is correctable in software. SWAVES-Behind observes two interference signals (100 kHz and 16 kHz) associated with the boom deployment. With the booms deployed the spacecraft pointing has become very stable with the pointing much less than 7 arc-seconds. We have ended our 24/7 coverage from DSN and have gone to our nominal 3 hour tracks per day per spacecraft. Engineering burns were performed on the C thruster set of both spacecraft. Both burns were completely nominal so all the thrusters have been checked out and are working. All the spacecraft subsystems are performing nominally. Previous item should have reported that PLASTIC was also partially powered up successfully on both observatories. The A1 maneuver was successfully completed on both spacecraft. The two IMPACT booms have been deployed. The High Gain Antennae were exercised through their full ranges of motion. Spacecraft subsystems are performing normally. The SECCHI instrument suites were turned on on both observatories and all telescope subsystems passed their functional tests. The SWAVES instruments were turned on, and both sets of antennae were successfully deployed. Parts of the IMPACT instruments have been powered on. Follow this link for prelaunch news.